TAPA Room 210: What is all this KONY business? What is all this KONY business? A couple of bad, bad men. Communications class has been talking recently about rhetoric, the art of persuasion, leading me to think of examples of persuasion around us. Nothing online is as hot right now as the Stop Joseph Kony video online. Hopefully, you've watched it one of the 200,000 times it's been posted on —if not, take a peek. 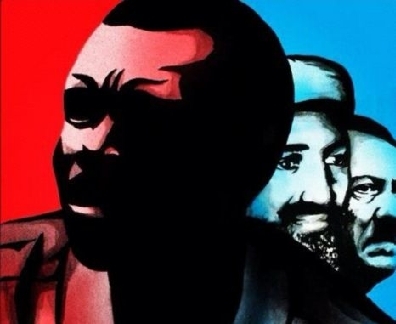 GOOD: What was the origin of the now-world-famous Kony video? JEDIDIAH JENKINS: We’ve made 10 documentaries before this one, and we’ve toured them around high schools and colleges since 2006. We’ve built a groundswell of grassroots support through our other films. But the reality is we would work so hard, and make all these videos, and pour so much effort into them, and they would get 3,000 views. But then a video with a cat flushing a toilet gets 40 million views. That left us going, "What are we doing wrong?" And one day, one of our colleagues said, "Man, this would be so much easier of we could make Joseph Kony famous and get people to actually know who he is. We wouldn’t have to fight so hard to get attention on these issues in Uganda." That was the inspiration. After that, our goal was to make a movie you could watch online, that’s entertaining, and that tells the story in a digestible way. And we had no idea how hungry the global audience was for that. GOOD: A lot of people are wondering what you expect this video to accomplish. What’s the best endgame as far as Invisible Children is concerned? JENKINS: Our hope is we see an effective end to the LRA. Ideally, beyond all things, we’d like to see Kony’s arrest or his surrender—and not just his arrest; we also want the other leadership of the LRA. But understanding that he is a madman, we understand that it could end violently. Luckily, the United States is involved, and they’re using a great team to try and mitigate violence as much as possible. If Kony is arrested, we’d like to see Kony tried at the Hague, and then it sets a precedent. It tells future warlords that if you want to commit genocide, if you want to commit war crimes, you cannot get away with it anymore. GOOD: What do you want to tell the film's critics directly? JENKINS: Our films are made for high school children. We make films that speak the language of kids. We say, "You may live thousands of miles away from these problems in Uganda, but those kids are just like you, and you can do something to help them by getting your government and your self involved." Our films weren’t made to be scrutinized by theGuardian. They were made to get young people involved in some of the world’s worst crimes. We can’t solve every crime, and we don’t intend to. But we can help fight the worst crimes.